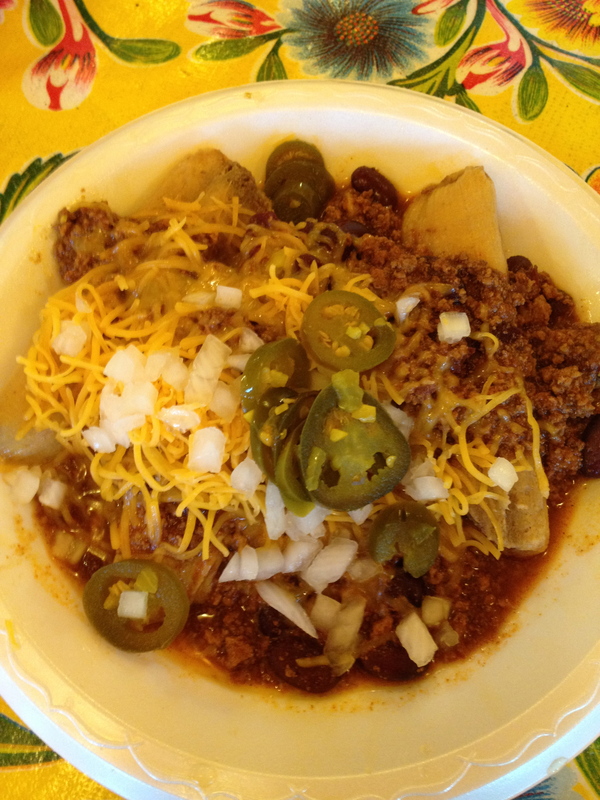 Family recipes and food that’s fun: Fat Mama’s Tamales — Natchez MS | Oh, the Places We See . . . Pass through Natchez. Check. Snap pics of historical homes. Check. Park your car and gaze at the mighty Mississip. Check. 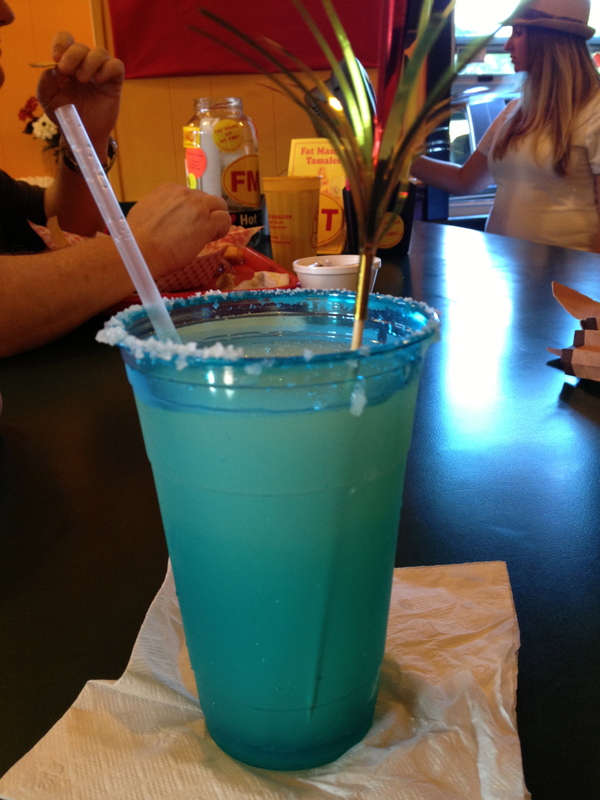 And then head to Fat Mama’s Tamales for a Knock-You-Naked Margarita. Check. And double check. We’d been to Fat Mama’s years ago. 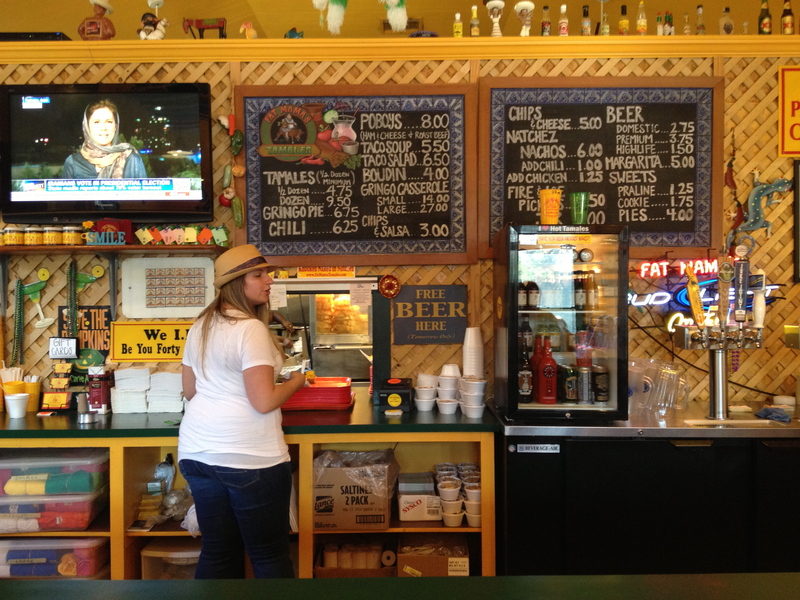 We’d heard about the tamales served out of a log house on Canal and decided we couldn’t leave without one. But this time around, we found a newer version — new building, bigger parking lot, and nicer bar — but still on Canal Street and still serving those homemade tamales and signature margs. Jimmy and Briton Gammill started experimenting — making tamales on Saturdays just for family and friends. And then the idea to “go big” became a reality! But it wasn’t without a lot of trial and error in the kitchen — so much so that their kids, noting how much was being cooked up in order to find just the right concoction, said, If Mama and Daddy keep messing up the tamale recipe, she’s going to be a ‘fat mama’ from eating all the mistakes.” (From the website you can access here.) Thus Fat Mama’s Tamales was born, open since June 9, 1989. The view from the bar allows you to look at the boards and talk to locals. Like Barbara. Who started right up telling us how much she enjoyed working with the restaurant. Then she asked one of the waitresses for a folder from behind the counter. She rummaged around until she found this picture she’s holding. 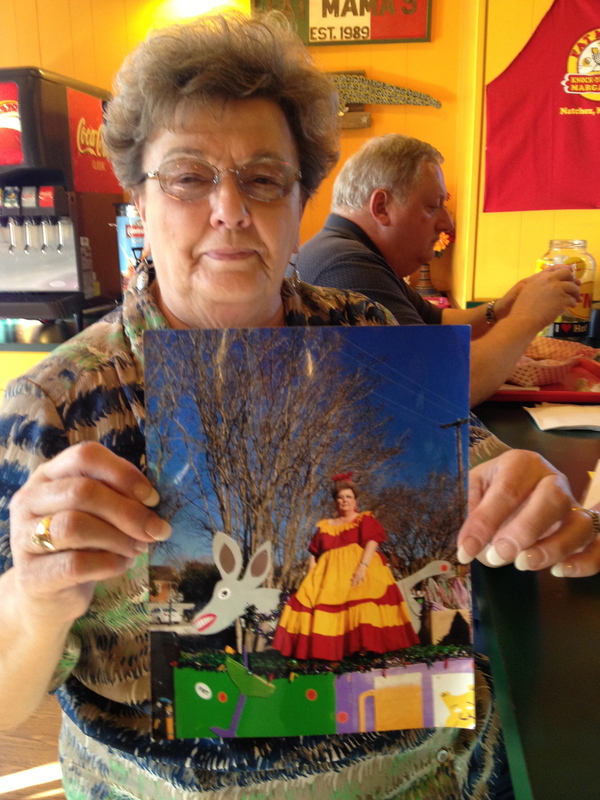 It’s Barbara all right in the recognizable Fat Mama’s Tamales outfit she wears to events and fund raisers. We’ve raised over $50,000 for charity, she said with great pride. And deservedly so. And what was Barbara drinking? A Knock-You-Naked Margarita, of course. There’s only one flavor but these limey little margaritas are served in different colored plastic cups with a party inside! 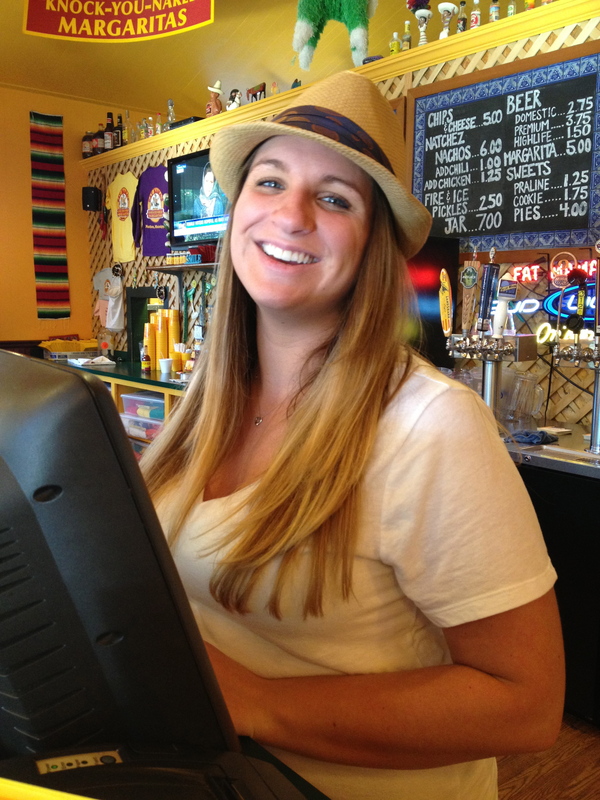 We ordered one of the heaping favorites: Gringo Pie. Three tasty, tender tamales covered in cheese, chile, onions, and jalapeños. And it’s a heap, for sure! You can dine in or dine out. 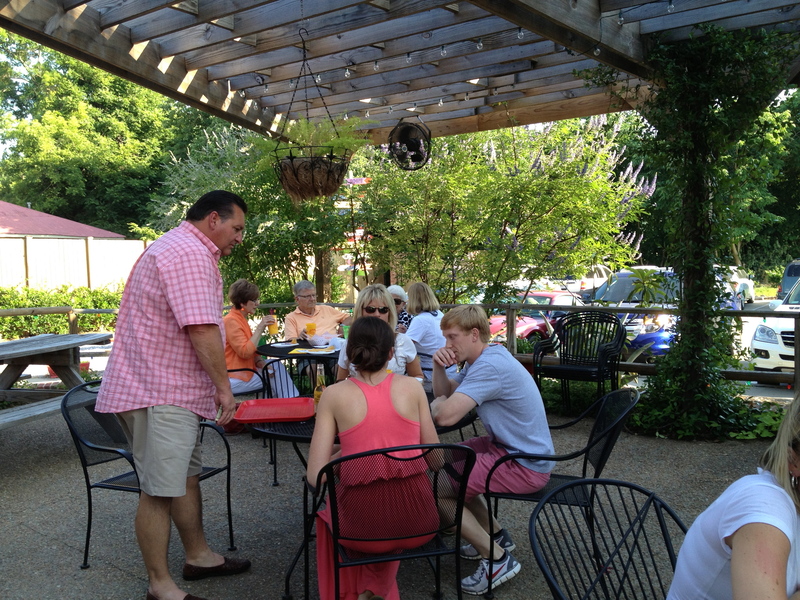 And even though some folks think this is just a bar with food on the side, you can see it’s family fun for all ages. T-shirts come in a rainbow of colors . 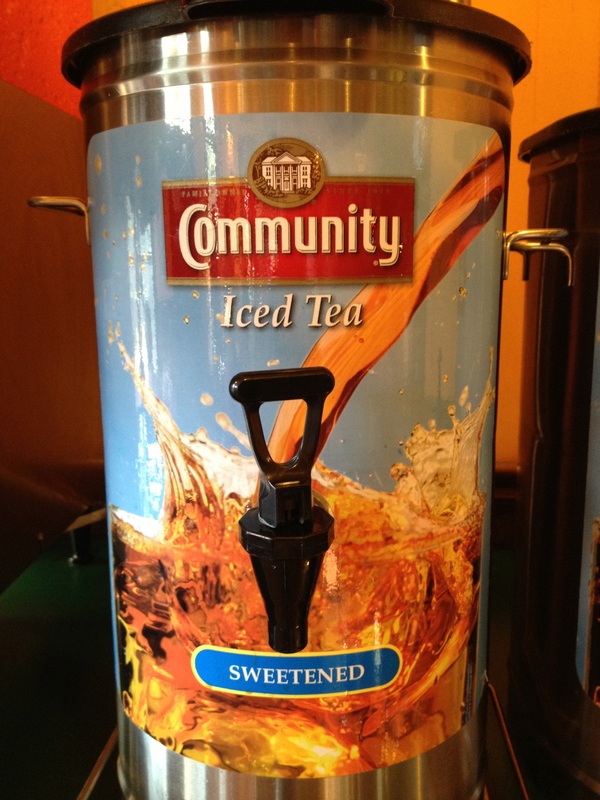 . .
and Community Iced Tea (I knew about their coffee, but the tea was news to me!) sits on a sideboard for refills. We paid Mary Katherine on our way out. She, too, said she loved working there. And everyone else seemed happy with the party atmosphere of pinatas, bright floral tablecloths, and people diving in to fire and ice pickles, boudin (a spicy Cajun sausage of pork and rice) or a hot ham-and-cheese po-boy. 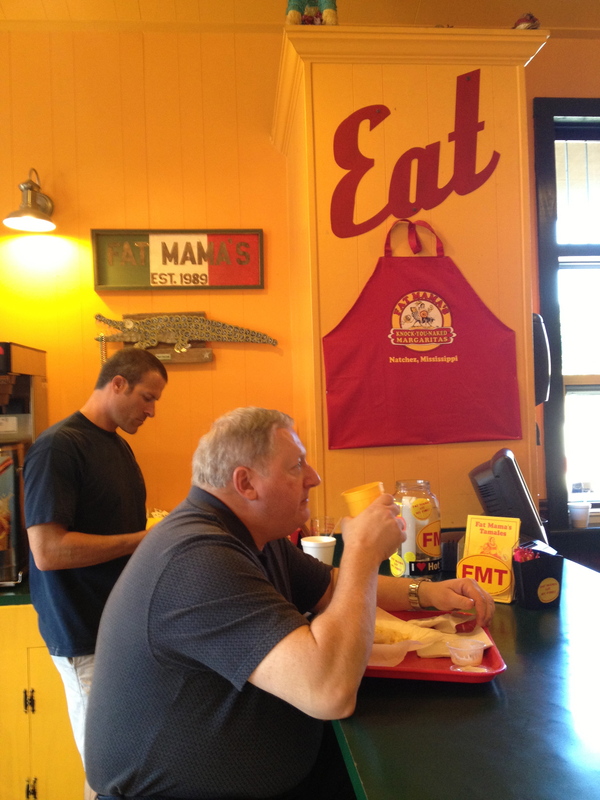 So, if you’re headed to Natchez for one of their many festivals (Click here for more info), or you’re just in town for a taste of the South, stop by Fat Mama’s for a tamale — or two or three or a half dozen! You’ll love ’em! 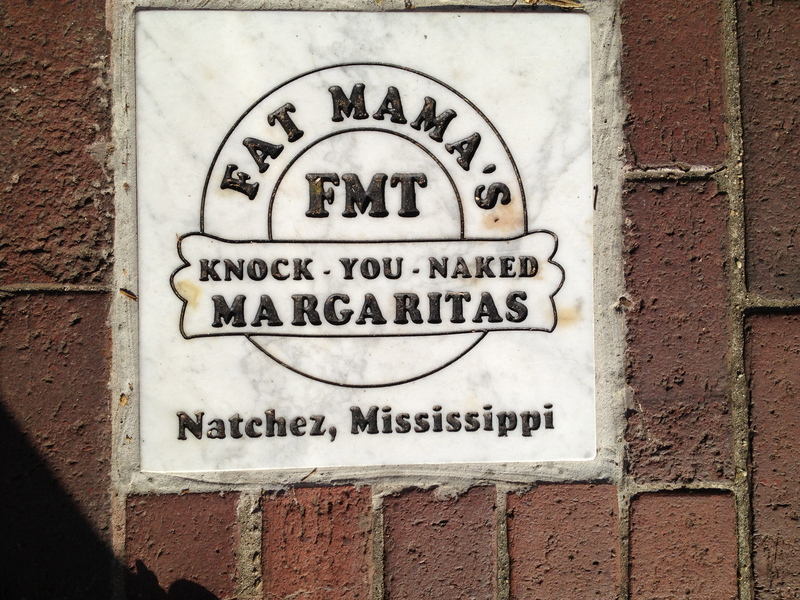 This entry was posted in Destination, Food, Mississippi, Restaurant, Travel and tagged Community Club Iced Tea, Fat Mama's Tamales, Gringo Pie, Knock-You-Naked Margaritas, Natchez. Bookmark the permalink. I’m thrilled not only that you liked that post but that you liked the restaurant, too! We had fun there — not too expensive, plenty of food, and casual atmosphere! Thanks in advance for linking to your blog. Really appreciate the nod! Rusha! So glad you’re getting to blog and travel. Like the others, this made me hungry. Safe journeys my friend. For traveler in Bourbon Country – you must stop by Buffalo Trace Distillery. Ran by the wonderful Van Winkle family. Tell them hello from Sandi Van Winkle! You must sample the Old Rip Van Winkle or Pappy (very trendy right now). I would love to stop there. Tried once, and they were closed. But if I get back that way, I’ll do my best to go during regular hours. I don’t drink much, but I’m fascinated by distilleries — seeing Jack Daniels was a fun trip! I, too, am fond of tamales — the handmade ones wrapped in cornhusks. These weren’t wrapped, but they were quite good even smothered with chile, etc. You’re in bourbon country? Somewhere in Kentucky? Louisville or Lexington area? It’s gorgeous country, if that’s where you are — fences, horses, rolling countryside. And free bourbon tastings at some of the stops! I’ve been to three! Did some work a few years ago in schools in KY and tried to smell the roses (Four Roses, maybe?) along the way! Beautiful country! Ooooh! I want a knock-me-naked margarita! You just need to come South and enjoy all we have to offer. I know I’ve enjoyed Idaho. Let me return the favor! Yummmm sounds delicious 🙂 I love margaritas and tamales – but my favorite of all the food you mentioned is boudin! I love that stuff. I’ve only had boudin once, so maybe I need to give it another try. We don’t have much Cajun food here, so when I travel I try new things. Thanks for commenting!